Here Michael Bellingham, PFMA CEO talks about what is buzzing around his head... it's the Pet Food Vision. The core purpose of PFMA is to place pets at the centre of everything we do. 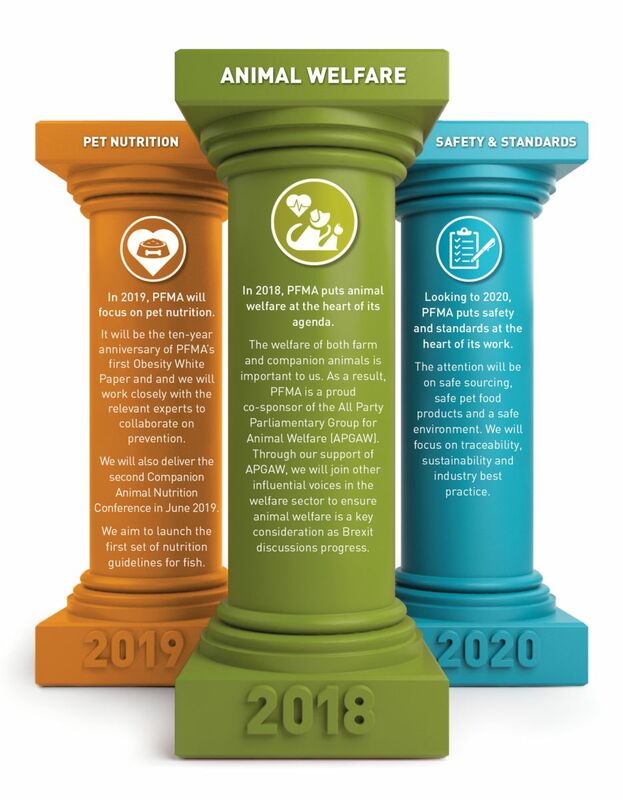 In 2018 we launch the PFMA Pet Food Vision, which focuses on 3 core pillars underpinning our work: animal welfare, nutrition, safety and standards. These pillars are areas of ongoing activity, however our Pet Food Vision spans a three-year period and each year we will throw the spotlight on a different aspect of our work. In 2018, PFMA focused on animal welfare. We believe that animal welfare starts with great quality nutrition. Our members are responsible for feeding the 50 million plus pets in the UK and we take that responsibility very seriously. As an industry, we are committed to providing high quality, nutritious and safe pet food, and providing clear guidelines on how to responsibly feed pets. We work closely with the European Pet Food Association (FEDIAF), and other leading authorities to achieve a balanced regulatory regime for the production of nutritious and safe food and are committed to continuously raising the bar across industry. PFMA is committed to maintaining a credible and responsible industry by placing pets at the centre of what we do. We are proud champions of some of the highest feed safety and animal welfare standards in the world. We work to ensure these are maintained and that our high standards of raw materials are not undermined by imports with lower standards. We encourage our members to have responsible sourcing policies and traceability programmes in place to ensure high standards and maintain trust. - Freedom from Hunger and Thirst - by ready access to fresh water and a diet to maintain full health and vigour. We use a significant amount of animal by-products, surplus to the human food chain. Whilst we have limited influence over these supply chains, we are committed to working closely with organisations such as DEFRA, NFU and others to maintain high standards of wellbeing. The welfare of both farm animal and companion animals is important to us and we recognise that success in these areas will come through collaboration. As a result, PFMA is a proud co- sponsor of the Associate Parliamentary Group for Animal Welfare (APGAW) where we join other influential voices in the welfare sector to ensure animal welfare is a key consideration. PFMA also keeps abreast with broader animal welfare matters and actively participates in forums such as the Canine Feline Sector Group. Through our participation with these groups we are able to ensure our members are up to date with the latest issues and can input on discussions as relevant. We recognise that education is an important aspect of animal welfare and PFMA helps communicate these welfare messages to a broader audience as a trustee of National Pet Month and through our support of the Animal Welfare Education Alliance.